Ubivox collects detailed statistics from you newsletter that enables you to, subsequently, analyze the results from the specific newsletter. The result gives you the ability of learning which type of content your subscribers are interested in. On your Dashboard in the Ubivox-system you will, at the bottom, find an overview of the latest newsletters that have been send as well as a link to statistics for each newsletter. You can also find statistics at the menu topic Statistics --> Newsletters --> click at Actions in the right side of the screen and then at Statistics. 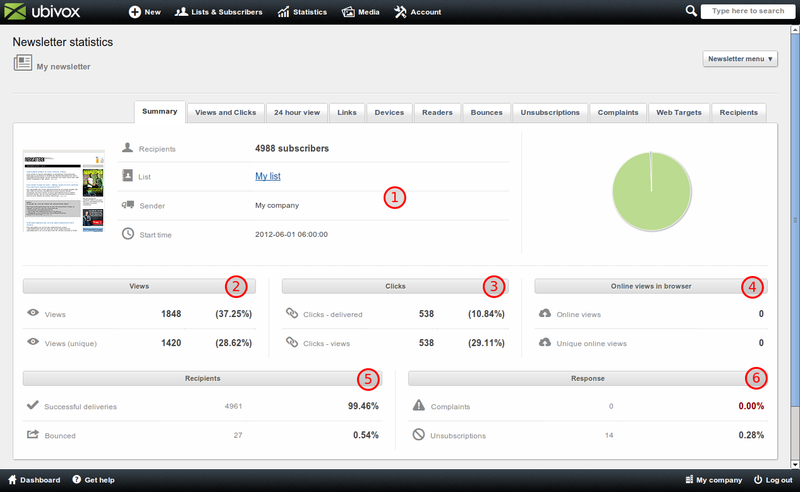 Below we will review the newsletter statistics as well as the content of each tab. 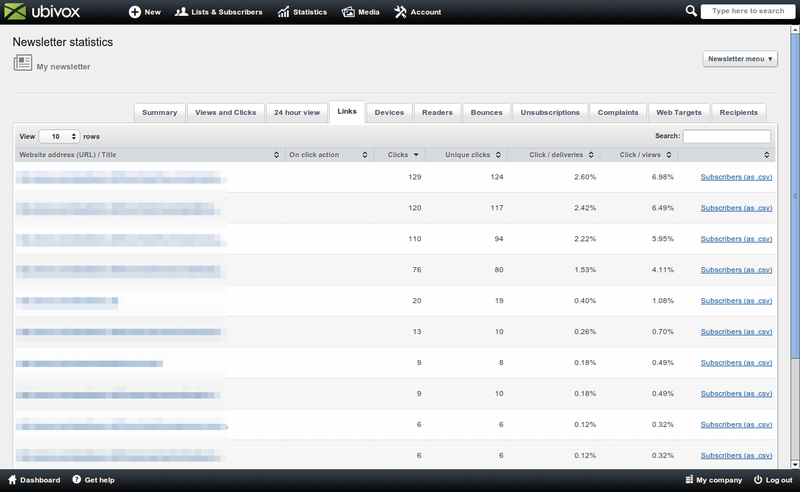 The newsletter statistics page gives you an easy overview of the response your newsletter has generated. 1: An overview of the newsletter's Subject, Recipients', the List it was send to as well as the time it was initiated, i.e. Start time$. The small preview of the newsletter can be seen in full version if you click on it. 2: Views (unique)' tell you the amount of subscribers that opened the newsletter. Views tell you how many times the unique subscriber has viewed the newsletter. If a subscriber opens the same newsletter two times within 30 minutes it will count as two views but just as one unique view. Read more about how Ubivox registers views and clicks here. 3: Clicks collects the data for the amount of clicks that your newsletter has received. We present two forms of click percentages. The first percent is calculated on the amount of delivered whereas the other is calculated from the amount of views that have been caused by the recipients. 5: Recipients tell you how many emails that have been successfully delivered and how many that has bounced due to a defect email address. Read more about bounces here. 6: Response tell you how many subscribers that have unsubscribed after receiving the newsletter and how many that has complained over the newsletter. Read more about complaints here. 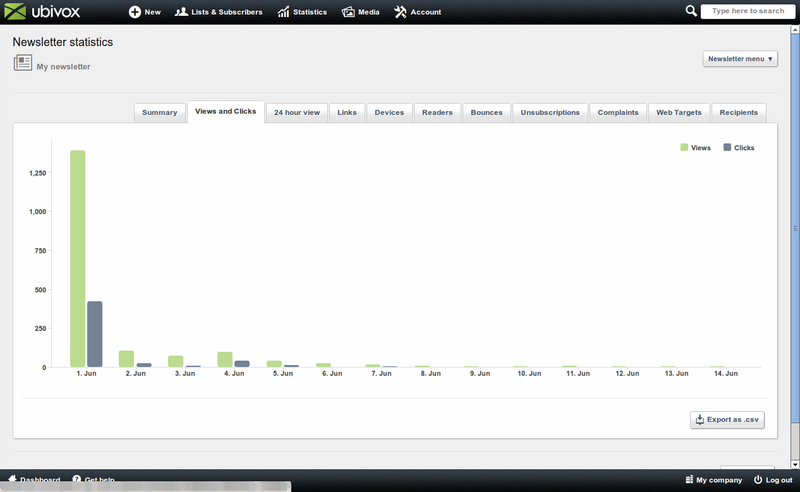 Here you will see a graph displaying the distribution of views and clicks starting at the time the newsletter was send and 14 days ahead. 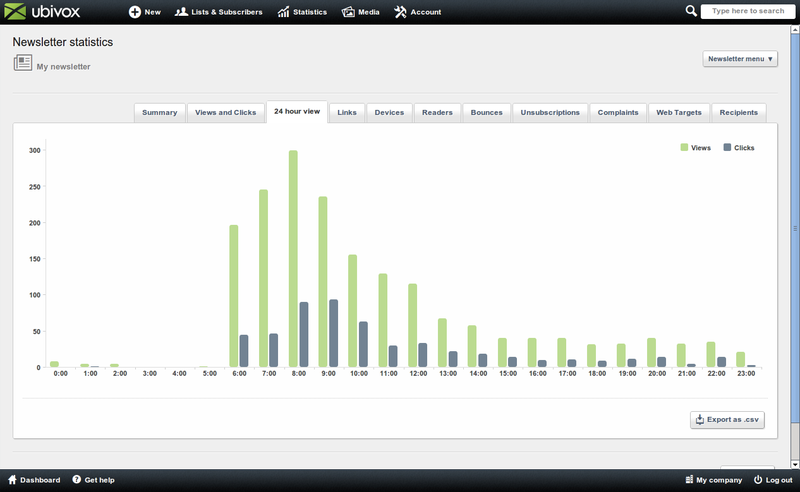 The graph displays views and clicks distributed, separately, into days. The day the newsletter has been released usually have more clicks and views. The information about what hours of the day most receivers view and click the newsletter is collected here. Please note that there may be a great difference between what hours of the day subscribers have had the time to view and to click. In our example there is a significant larger amount of views between 7-8 AM than between 6-7 AM but the amount of clicks are almost the same. This indicates that subscribers who see the newsletter between 6-7 AM do not have the time to click at the links but rather just read the substance of the newsletter superficially. This tab contains a list that contains all the links in the newsletter that have received one or several clicks. This provides you with the information of which content that interested your subscribers the most. Use this function to decide which type of content you wish to focus on in future newsletter and what type of content you should provide less of. How your subscribers read you newsletter is decisive for the strategy you need for your content. The Device statistics tells you how many subscribers read your newsletter at, for example, mobile devises (iPad, iPhone, Android) - if there are many mobile readers you may have to consider shorter content with links to the full stories. This insures that your newsletter is easier to asses on a small screen. The remaining tabs, Readers, Bounces, Unsubscriptions, Complaints, Web targets and Recipients are simple summaries that shows precisely who has read a newsletter and which defective email addresses we have encountered. At each summary you are able to export the receivers as a CSV file, this enables you to, for example, unsubscribe receivers that have bounced in your CRM system.